Shakespeare’s two plays that focus on the reign of King Henry IV are a panoramic view of medieval life. The historical portions, which occur early in the 1400s, take on the question of a monarch’s duty to his country, not least of which is preparing the heir to take over. Ignoring his father’s complaints, Prince Hal (Alex Hassell), Henry’s heir, fritters away his time with lowlifes, notably Falstaff, the fat, rascally knight who is one of Shakespeare’s great creations. The political maneuvering of nobles in rebellion also shapes the narrative about high-born responsibility, leadership and compassion. Matthew Needham plays Hotspur in Henry IV, Part 1. Top (from left): Antony Sher as Falstaff, Sam Marks as Poins, and Alex Hassell as Prince Hal. Yet in the tavern scenes and, in Part 2, the country scenes with Justice Shallow and Silence that involve conscription of men for war, the life of the common man is portrayed, more closely reflecting Shakespeare’s own time. From the king down to the lowest conscriptee, the plays provide a broad view of issues that touched Queen Elizabeth I and her subjects. As Henry IV, Part 1 opens, the king (Jasper Britton) announces plans for a crusade to Jerusalem to retake the city from the Saracens—something he promised in his last speech in Richard II, the chronological predecessor (and also part of the RSC’s visit to the Brooklyn Academy of Music). Quickly, however, Henry is advised of rebels gathering against him: the Earl of Northumberland (Sean Chapman), a former ally in deposing Richard II; his brother, the Earl of Worcester (Antony Byrne); Northumberland’s son, and Lady Percy’s brother, Lord Mortimer (Robert Gilbert). Chief among them, though, is Matthew Needham’s stunningly good Hotspur, a fierce, intemperate warrior whose skill at arms is set against the dissipated life of Prince Hal (Alex Hassell). The trip to the Holy Land must be postponed. Falstaff, the surrogate father to Hal, is embodied by Antony Sher, a great actor who has nevertheless seldom tackled comedy. Anyone who has seen him in classical roles (Massinger’s The Roman Actor, Marlowe’s Tamburlaine, Marston’s The Malcontent) knows he is a master of the language and a powerful stage presence. As Falstaff, though, something is not quite right. Sher growls a lot to sound dissipated and lumbers around to seem overweight. He can nail the wit, but one has the impression of someone giving a grand performance (and Falstaff is an actor at heart) but not completely inhabiting the character. He’s great fun to watch, but his roistering as Falstaff doesn’t feel natural. Yet there are splendid moments: when he’s trying to connect with his cronies in the darkness on Gad’s Hill to rob some pilgrims, he comes on, stepping slowly and whispering loudly, “Poins? Poins?” to find his compatriot. Needham (right) with Jasper Britton as King Henry IV. Photographs by Richard Termine. In a similar way Hassell is not totally persuasive as Hal. Frivolity and callowness don’t sit naturally on him, but as he assumes the gravitas required of a future king, he becomes more persuasive. He gives the speeches clearly but, perhaps because he’s the centerpiece of three plays, there are times when they’re closer to masterly recitation than insightful characterization. In Part 1, however, Britton, overshadowed in Richard II by David Tennant’s terrific performance, comes into his own as Henry, the usurping king who struggles with his son’s wastrel ways. His halting first lines, “So shaken as we are, so wan with care,” present a royal whose voice literally trembles. And news of Hotspur’s valor against rebels brings joy until his counselor Westmoreland remarks, “It is a conquest for a prince to boast of”—pointing up that Hal should have been leading the victory. The haunted Henry’s grappling with his son’s fecklessness is an important through line for both parts. Part 2, however, also affords Hassell the opportunity to navigate from Hal’s callowness to something that fits the actor better: nobility and valor. Looser than Part 1, Henry IV, Part 2 also lacks Hotspur. Moreover, the lower-class scenes in it prove a slog. One problem is that Antony Byrne’s Pistol, a swaggering braggart soldier, is a type that may have been funny 400 years ago but grates now. Made up as a yob, with thick black mascara under his eyes and a braid, and dressed in a punkish leather outfit by Stephanie Arditti, he is a tedious figure, offsetting Falstaff’s raillery. Thus, much of the first half of Part 2 is an ordeal, redeemed after intermission by Oliver Ford Davies’ hilarious Justice Shallow, paired with Jim Hooper’s wide-eyed, perplexed Silence. Hassell as Hal banters with Sher as Falstaff. But the most memorable scenes are those with Hotspur. “I can call spirits from the vasty deep,” says Joshua Richards’s Gandalfian Welshman, Owen Glendower, a behemoth in skins and long gray beard, and Hotspur’s in-law. To which Hotspur replies: “Why, so can I, or so can any man/But will they come when you do call for them?” And his scenes with his wife (Jennifer Kirby) are both touching and frustrating; though in love, each tries to connect emotionally with the other and doesn’t always succeed. Other standouts are Sam Marks’s vital Poins and Richards (again) as a red-nosed, dryly comic Bardolph, one of Falstaff’s cronies. The plays are rich with smart business by director Gregory Doran. With Hotspur on a tear, his father, Northumberland, grabs him by the scruff of his neck and forces him to his knees. Some extended comic business with the serving-boy Francis plays beautifully (and sets up a cameo for Henry V). One clumsy interpolation, however, is Doran’s opening Part 2 with Rumour (Byrne) coming on in modern clothes against a field of projections of #Rumour. It may be intended to parallel gossip on the Internet, but it’s a jarring moment. Though the first part is the stronger play, together the pair are an indispensable challenge that any lover of Shakespeare’s work will want to experience. They aren’t often done together, and this is an opportunity to hear verse-speaking of a high order and experience outstanding, if not flawless, productions. 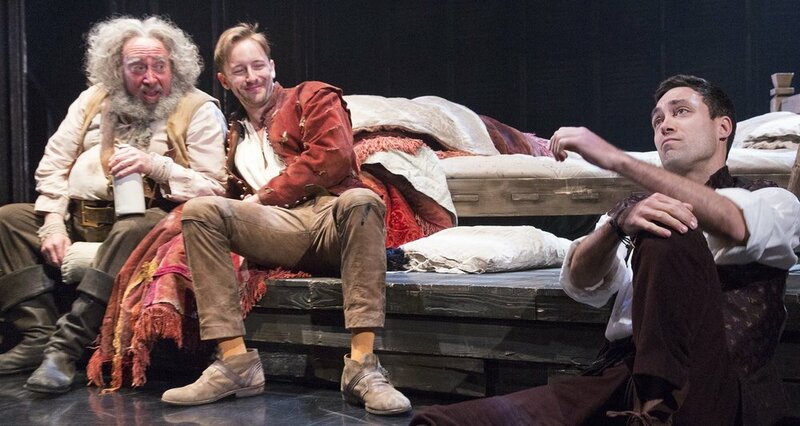 The Royal Shakespeare Company’s Henry IV, Part 1 and Part 2 play in repertory with Richard II and Henry V through May 1 at BAM Harvey Theater (30 Lafayette Ave. between Ashland Place and St. Felix Street in Brooklyn). Tickets start at $35. Visit www.bam.org/theater for information.